ODESSA, Ukraine -- The three-week election campaign turned into a game of “Survivor” for Vladimir Rondin, a candidate from Odessa in parliamentary elections that could decide whether Ukraine sets a new, more democratic course, or slips back into the old mire of corruption that has plagued its politics for more than 20 years. 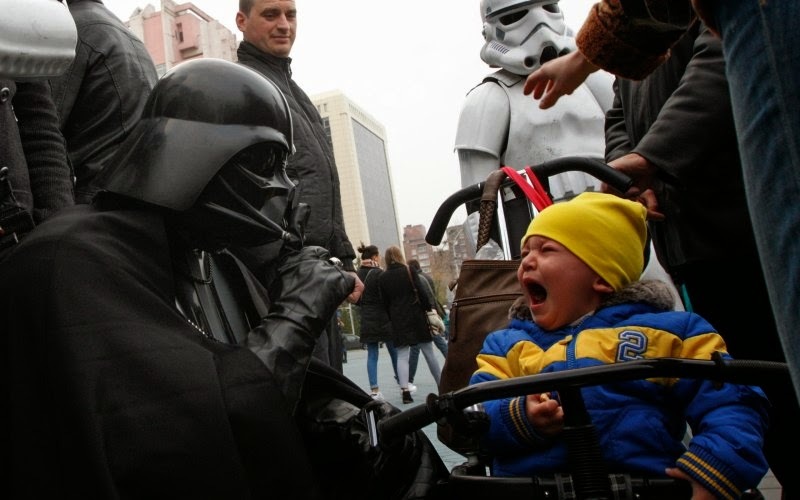 Activists from the Internet Party of Ukraine, dressed as Star Wars characters, talk to voters. Rondin supports President Petro Poroshenko. His main opponent is linked closely to the pro-Russian elements in the country. In the East, those two sides are engaged in open warfare. In Odessa, in the West, the conflict is only slightly more subtle. A couple of dozen provocateurs followed Rondin to his meetings and rallies, shouting insults and denouncing him as “an oligarch," one of the most damning things anybody say about you in today’s Ukraine politics, especially if it’s true. And, in truth, many of the major political figures fit that description. Last week, during a Rondin meeting with university faculty and secondary school teachers, two athletic, heavily muscled men attacked the candidate, pushing him down onto the floor, knocking aside empty chairs in the front row. Then they left, mission apparently accomplished. The candidate found out that there were two more candidates with his name, Vladimir Rondin, registered for the election from the same parliamentary district in Odessa. Earlier this week, The Daily Beast accompanied Rondin (the real Rondin) on his campaign trail around Odessa’s Primorskiy neighborhood. As he talked about his "life threatening” struggle, the candidate said he wasn’t surprised to see criminal methods used against him. Rondin doesn’t mince his words. And he’s got a point. Back in 2004, the opposition criticized Kivalov, the chairman of the Central Election Commission, for falsification of results and for allegedly receiving millions of dollar in bribes from then-presidential candidate Viktor Yanukovych. After the Maidan revolution last winter, Ukraine demanded full accounting for the activities of all officials working under Yanukovych, including Kivalov, a wealthy Odessa businessman and parliament deputy from the ex-president’s Party of Regions. But Kivalov seemed confident there’d be no punishment. It is not easy to expose the activities of a powerful millionaire with a network of connections, Rondin told us, but it can have an impact. Medical personnel were expecting Rondin on Monday at Filatov Institute of Eye Diseases and Tissue Therapy. The candidate said he had initiated a criminal investigation of “corrupt and criminal methods” used against him during the campaign. But it isn’t at all clear the issue will be resolved by the time people head to the polls on Sunday. Indeed, the Ministry of Interior released a report of 141 investigations against candidates accused of vote-buying around Ukraine. Minister Arsen Avakov listed Odessa as number one on the black list and asked Ukrainians to report as soon as they heard about any candidate paying money or giving “presents” to voters. "We have been investigating dozens of cases, including the Odessa deputy from the Party of Regions, Sergei Kivalov,” the minister wrote on his Facebook page. At one of his rallies, Kivalov reportedly gave out packages with food items and money, which investigators construe to be bribes. In spite of all the disappointments, failed expectations of transparency, and the fear and pain caused by the war, it’s expected that over 60 percent of Ukrainians will cast their ballots on Sunday. The Maidan revolution was meant, at least in part, to arouse a sense of social awareness, to make the electorate skeptical and demanding, many hope to follow through on those ideals. “Ideally, I would like to see deputies punished for falsifying results and even for failing their promises to their electorate,” says Odessa entrepreneur Boris Khodorkovsky. But a full accounting of the activities of politicians before Maidan is not in the cards for now, says Rondin. “Something tells me there will be no ‘criminal deputies’ under investigation,” he said.